The 2012 edition according to Microsoft has cloud platform vision at its heart with greater flexibility and agility enhancements in virtualization, networking, virtual desktop infrastructure, access and information protection, web application platforms and much more. If you are aiming at a 70-410 certification in this technology, this document contains detailed information about all the various aspects of configurations required to pass the exam and become a Microsoft Certified Solutions Associate (MCSA). This server operating system comes in a few flavours and depending on what you intend to do with it, a few editions of the software exists with varying virtualization capabilities suitable for organizations of any size. Unlike previous versions, Server 2012 Standard Edition comes with the full functionality with the only difference from Data Center Editions being the ability to have more virtual machines. During the installation, you will be prompted to choose an administrator password. Microsoft enforces the use of a combination of special characters, upper case letters and numbers to create a strong password. 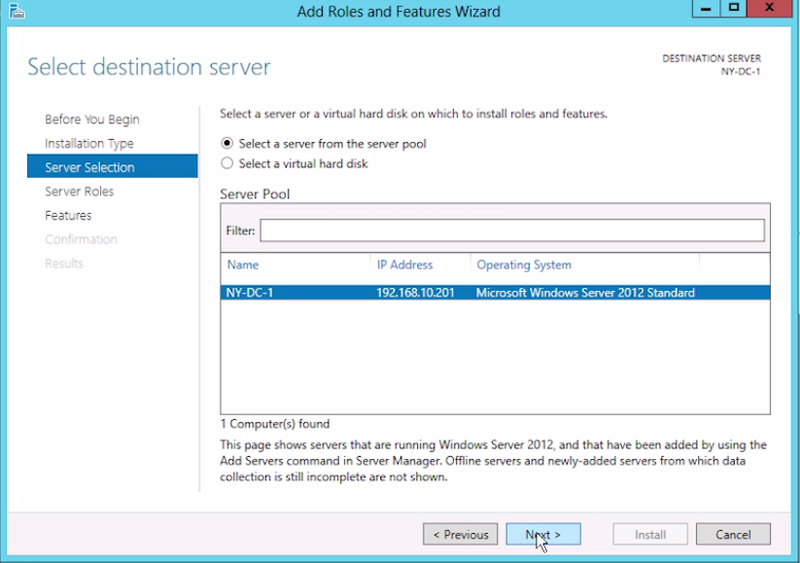 The server manager will be launched as default once Windows Server 2012 installation is complete. The server manager is where all your configurations for managing Windows Server 2012 will happen. Base configurations such as Computer name, Domain, Firewall status, Ethernet IPV4 or IPV6 addresses and the option to enable the server to accept remote connections can all be set up in the Local Server interface. 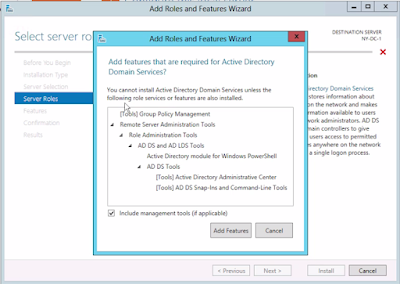 Notice on the left side of the server manager are the tabs to manager Active Directory Domain Services, DHCP, DNS and File and Storage Services. 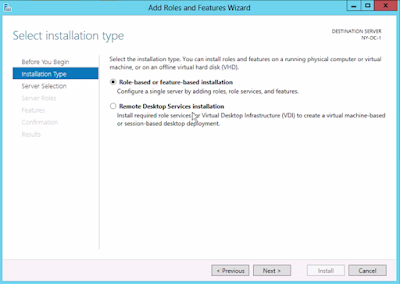 This article will be exploring what all those services function and the configuration steps to get them up and running. Be advised as this a learning environment we are working in, I would advise to turn off your Firewall as you may run into some issues configuring some of the services or features of Windows server 2012. Of course this is not something you would like to do as an administrator in the real work environment, so remember to turn it back on after you are done configuring your required features. A very crucial part when setting up your Windows server is to configure the IP address that would form the bases of identifying the server as well as other devices being able to communicate with your server. You will find for example that the ability do remote access your server will depend on the address you have assigned. Notice by default, the IP address is provided via DHCP and we want to change that. 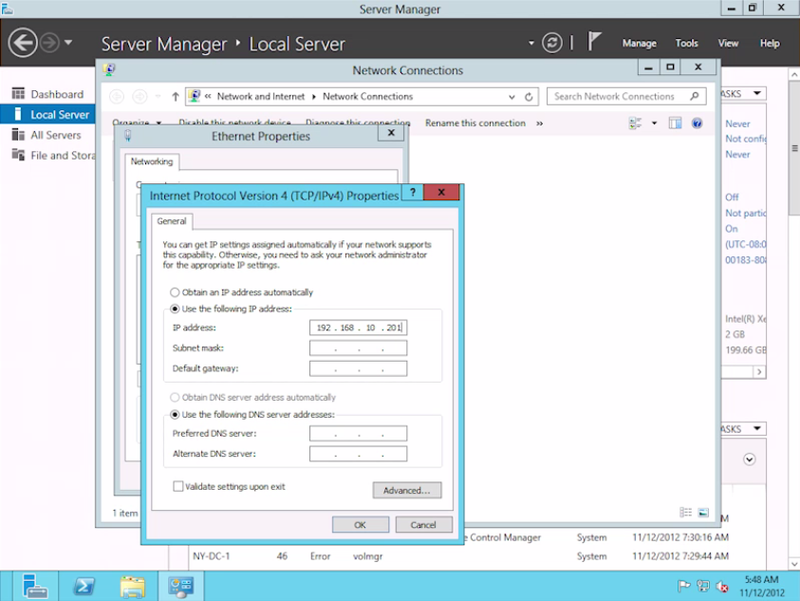 To do this, Click on the Ethernet IPV4 link on the Server Manager > Network Connections > Right Click and Choose Properties > Highlight IPV4 and select Properties. You can now assign a static IP address of your choice bearing in mind the network you are currently on, For example 192.168.10.130. If you are not sure what network you have, simply launch command line on your host machine and type in ipconfig to display your IP address and the default gateway which will be the address your router uses to reach the rest of the internet. Snapshot can be found below. 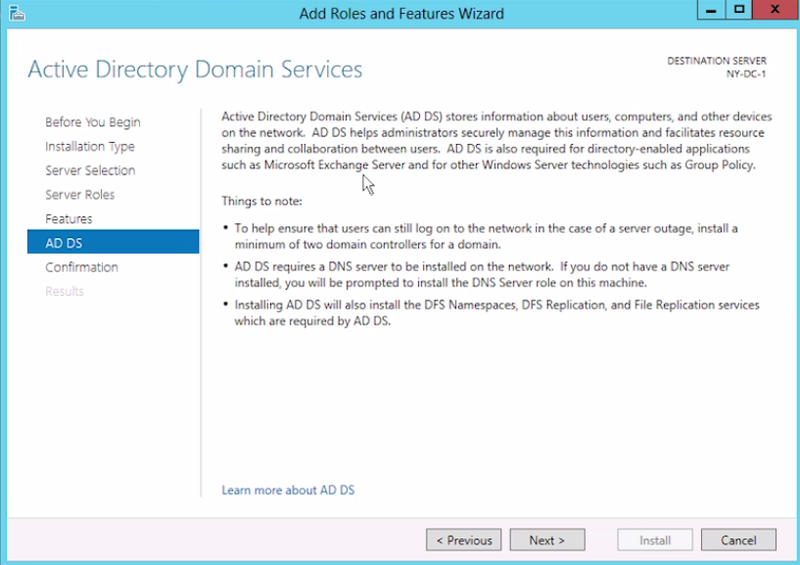 Simply known as AD DS, Active Directory Domain Services is a powerful tool responsible for storing data used to manage communications between users and domains, this includes logon processes, authentication and directory searches. 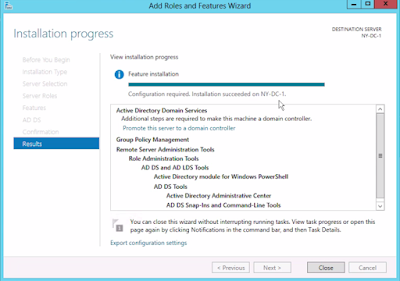 An Active Directory domain controller is a server that is running AD DS. 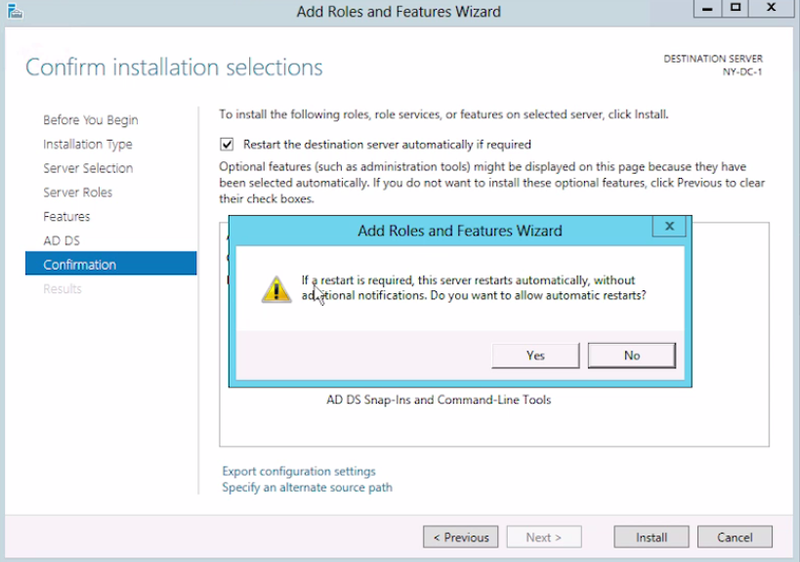 To set this up, click on the dashboard and select Add Roles and Features to launch the wizard. Notice above there are two types of installation you can choose to configure a single server roles, services and features, as well as remote services installation for Virtual Desktop Infrastructure (VDI). The next screen lets you choose the server to install AD and if you manage multiple servers, these will appear here for selection then click next. The next screen shows all the server roles you can choose to install. We at this stage are only interested in AD DS so tick the box and click next to proceed. Notice I dialogue box pops up on screen informing you of other tools which are needed for AD DS to function properly. 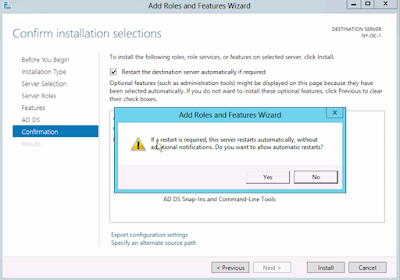 In previous versions of Windows server, you will have to manually go back and install all those features such as Group Policy Management tools in order to proceed but this time, Microsoft has streamlined this task by automatically adding these tools as part of the installation. On this screen, you get to see some more information on AD DS and some other features such as DNS server required to run Windows Server 2012 successfully. 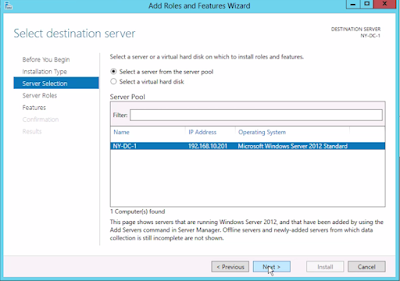 The final confirmation screen presents you with an option to restart the destination servers automatically; you can tick this box if you have remote servers somewhere you are managing in this console but bear in mind, any users or computers connected will be kicked while the reboot happens. 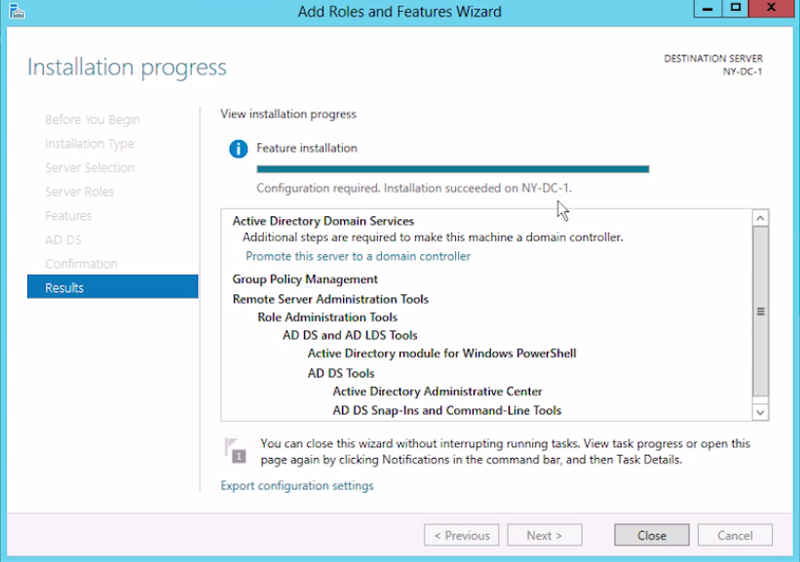 The installation should now be complete with a notification requiring additional steps to make your server the main domain controller. Click in the blue link to configure your domain. 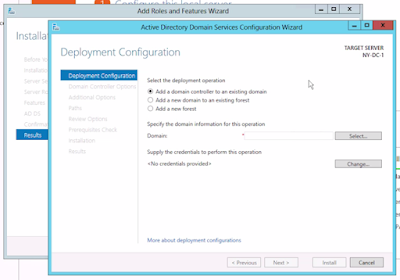 In this section you are presented with three deployment options to add a domain controller to an existing domain, add a new domain to an existing forest or add a new forest. Since some of these terminologies may be new to some users, let’s take a closer look at some of them before we proceed. 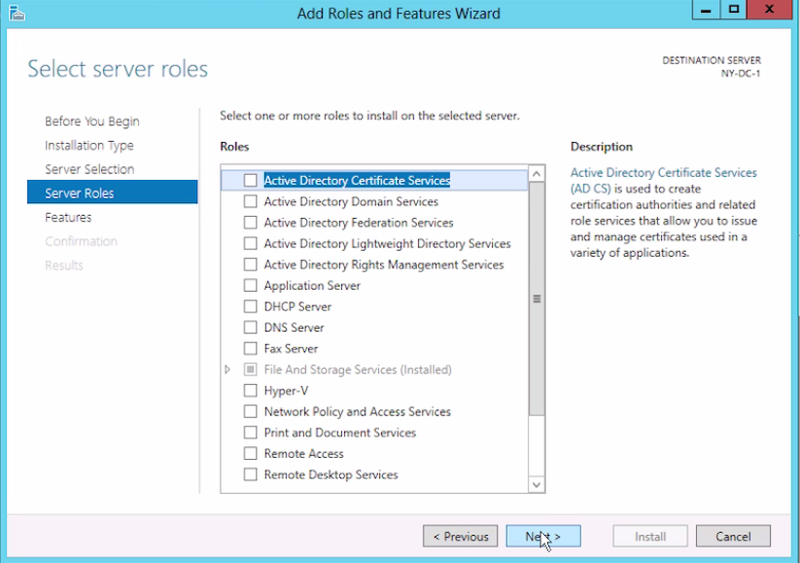 In this section, we will examine some of the terminologies associated with Active Directory Domain Services. As you use Windows Server more regularly, you will become familiar with these features and the functions they provide in the management of servers. Partition – A logical section of the actual AD DS. Schema – This defines all the attributes for all the objects in Active Directory. Site – A collection of Active Directory objects defined by their physical location. Organisational Units (OU) – Containers in AD DS that provide a framework for administration and Group Policy links. Domain – The core administrative units of AD DS. Tree – A collection of domains that share a common DNS namespace. Forest – A collection of one or more Active Directory domains that share a common logical structure, directory schema, directory configuration and global catalogue. Domain Controllers – This contains copies of the AD DS database. 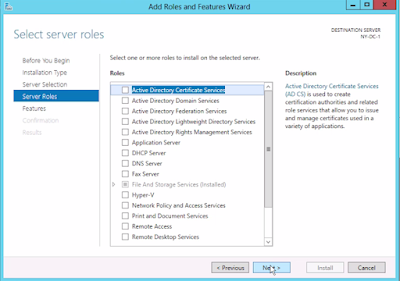 Data Store – The physical file on each domain controller that stores the AD DS information. Global Catalog Servers – Domain controllers which host the global catalog, which is a partial, read-only copy of all the objects in the forest. Read- only Domain Controllers (RODC) – Contains a special read- only copy of the AD DS database which can be used in environments where security is priority and administers want no one to make changes to the database file. Domain Name Services (DNS) is an important piece of technology responsible for resolving domain manes into IP addresses and vice versa. Google hosts countless domain resolution servers usually reachable by 8.8.8.8, automatically updating and maintaining a list of fully qualified domain names (FQDN) and IP address tables. This is used to identify and route traffic requests to their desired destinations on the internet. In this lab however, we want to build our own server and configure it to act as its own DNS server as first point of call for resources requested by our connected machines. Any other requests outside the scope of our server can then be sent to external DNS servers using our default gateway. 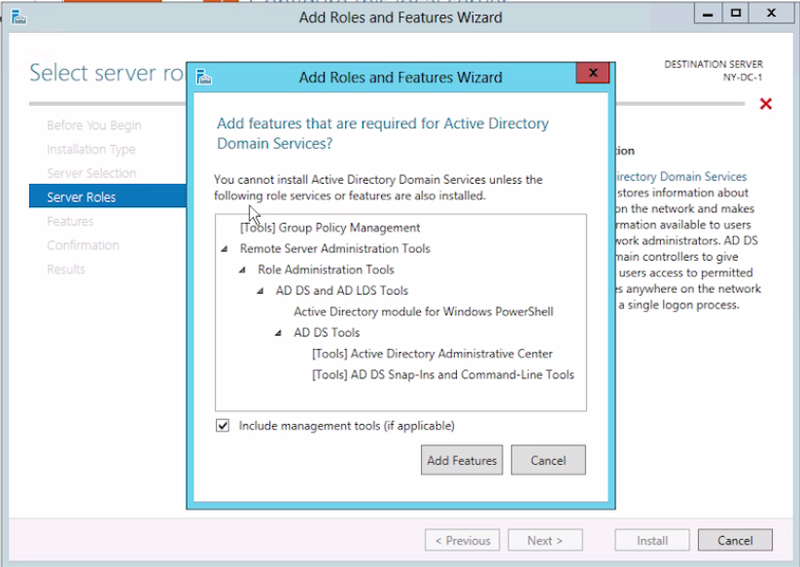 Notice and ignore the prompt about delegation for DNS server in parent zone and click Next. You can now verify the NetBIOS name assigned to the domain and make changes if required. Specify the location of the AD DS database and Log files which by default are located in C:\Windows\NTDS and SYSVOL folder located in C:\Windows\SYSVOL. Next to proceed. We now get the chance to review all the configuration carried out so far. Click previous to review any options in the set up. 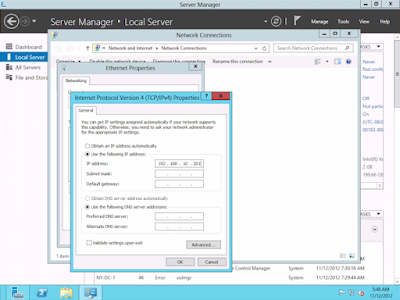 Once the prerequisite checks have passed, you can proceed to install your DNS server. If you plan to install multiple servers in the future, you can view the Windows PowerShell script for AD DS Deployment which can be saved as a .txt file and used for other server builds. We shall look further into the scripting language PowerShell which is powerful for managing and automating server tasks. 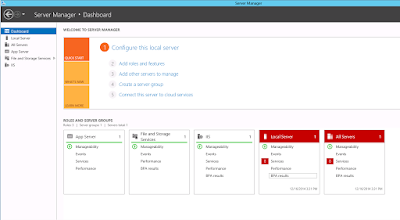 Server Manager Interface with AD DS and DNS configured. Explore more available features. Well done if you’ve made it this far, you must be excited as I am about delving even deeper into the powerful capabilities of the Windows 2012 R2 operating system framework. Check back on the website and join us for the next lesson in User Account Management.